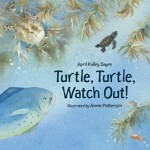 When the new edition of my book, Turtle, Turtle, Watch Out! 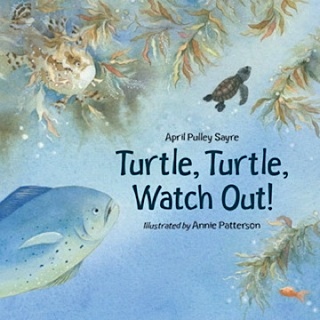 was created, there was a lionfish on the top left corner of the cover. My reaction: WHAAAA? I’ve been snorkeling the reefs in the Caribbean for about 20 years and I knew that was not a native fish. After a little research, though, I found out more about the lionfish invasion of the reefs. And I found out this fish is indeed widespread now. I thought having this fish on the cover would be a great teaching point. Kudos to the illustrator, Annie Patterson, for putting it there in the first place. It’s a great jumping off point for students researching this issue. I just watched the tv entrepreneur show, Shark Tank, where Dave Johnson and Gary Groomes of Traditional Fisheries talked about the lionfish invasion of Atlantic reefs. Teachers, I think you might be able to develop some terrific research/conservation projects related to this issue. Perfect for common core and research. There are many logistical aspects to accomplishing what these folks are trying to do. Eat the fish that is eating the reefs! They made a great case on the show for this solution.